A common misconception about space is that objects are free from the shackles of gravity. The truth is that every place in space has at least a small amount of gravity — that’s why the moon remains in contant orbit around Earth. So then, why do videos from the International Space Station (ISS) feature astronauts float in place, appearing weightless? It’s because of something called microgravity. Objects in the ISS are in a state of microgravity, a sort of perpetual free fall, moving at 17,500 miles per hour. But instead of falling toward the Earth, they fall around Earth, matching Earth’s curves to stay in orbit. In microgravity, water doesn't flow freely but rather clumps together like a blob. This can make it kind of difficult to wring out wet washcloths. The water clumps together, sticking to the washcloth like a weird, gelatinous casing. Droplets of water will orbit a charged surface (like this knitting needle) like tiny planets orbiting a strangely shaped star. 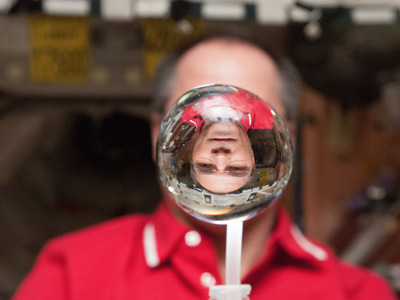 Astronauts can even use special water-repelling paddles to play a game of water ping pong in microgravity. When you boil water on Earth, thousands of tiny bubbles of water vapour come bursting towards the surface. In space, there is just one giant bubble, beating in the water almost like a heart. Instead of rising upwards, flames move outwards in every direction, creating a sphere. On Earth, slight differences in air pressure produce a flame that pushes upwards towards thinner air. But not in space. There, the flame experiences equal pressure from every direction, causing it to move outward from its source in the shape of a sphere. Rather than extinguishing under the same low-oxygen conditions that would put them out on Earth, flames actually adapt, breaking off into little flamelets that zig zag across a surface. To figure out what they would do if a fire broke out on the ISS, scientists are doing controlled studies of flames in microgravity.